Intuitively one expects something on the order of , since we’re adding together what are essentially independent random variables. It’s not too hard to throw together a quick simulation, without even bothering with any trigonometry, and this was my first impulse. This code just picks the uniformly at random, and takes the maximum of for values of which are multiples of . This is a bit tricky: in the matrix in max.of.sines, output by outer, each column gives the values of a single sine function , and rowSums adds them together. That is, the sum of a bunch of sinusoids with a period is a single sinusoid with the same period, and an amplitude easily calculated from the amplitudes and phases of the original sinusoids. There’s a formula for as well, but it’s not relevant here. If you take the expectation of both sides, and recognize that is 1 if (it’s ) and 0 if (just the average of the cosine function), then you learn where is the number of summands. That agrees with our original guess, and is enough to prove that by Jensen’s inequality. which is exactly the given above. So the amplitude of our sum of cosines is just the distance from the origin in a two-dimensional random walk! It just remains to show that the expected distance from the origin of the random walk with unit steps in random directions after steps is . A good heuristic demonstration is as follows: clearly the distribution of the position is rotationally invariant, i. e. symmetric around the origin. The position is the sum of independent variables each of which is distributed like the cosine of a uniformly chosen angle; that is, it has mean and variance . 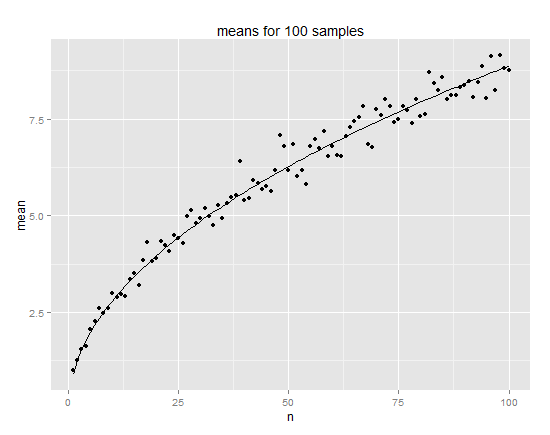 So the -coordinate after steps is approximately normally distributed with variance . The overall distribution, being rotationally symmetric with normal marginals, ought to be approximately jointly normal with and both having mean 0, variance , and uncorrelated; then is known to be Rayleigh-distributed, which finishes the proof modulo that one nasty fact. Oh, nice bit of work. I’d missed the original problem posting, which is a shame, since it’s a good one. Hallo Mr. Lugo. I can not find any email contact on you at this web so I’m trying to ask you a question concerning the “Random sums of sines..” this way. Your blog is hugely interesting for me, since for several weeks already, I was trying to explain to myself why the expected value for the sum of N sines of random angles should be kind of sqrt(N). I encountered this problem trying to understand a physical theory behind some nanocrystalline materials. I’m not any good in math nor in English and maybe this is why I didn’t understand the last sentence of this blog saying: “.., which finishes the proof modulo that one nasty fact. ” This sentence sounds a little frightening to me, although I don’t understand it fully. So let me ask what did you mean by the formulation “modulo that one nasty fact” ? Which fact did you mean? And why you called this fact nasty? Did you mean some weak point of your derivation?